Have you received or sent a postcard lately? Although many of us rely primarly on digital communications today, there's still a time and a place for traditional communication tools like these remarkable postcards inspired by Darcy Dougherty Maulsby's book "A Culinary History of Iowa: Sweet Corn, Pork Tenderloins, Maid-Rites and More" from The History Press. You'll love these compelling black-and-white images reflecting Iowa's rich culinary history from years gone by. 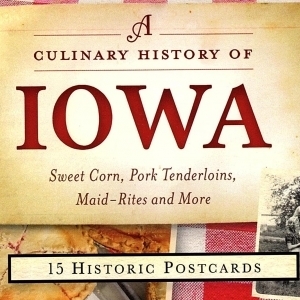 From Maid-Rites to 4-H to the Amana Colonies, celebrate the remarkable stories behind Iowa originals with this unique collection of 15 postcards, which include a recipe for Iowa's famous Scotcheroos!